If you’ve seen a vehicle that’s been on display at the SEMA Show, whether online, in the pages of a magazine, on televisions, or perhaps even in person, then you know that these customized rigs are among the finest creations from the most creative builders from across the country. And while we’re sure that at least once or twice you’d wished that you could drive one of the vehicles on display, here’s your opportunity to actually own one and help a great cause at the same time. That’s exactly the opportunity that Lyon and Jennifer McClenahan of Finish Line Speed Shop in Bremerton, Washington, want to provide you. According to Lyon, "We built the truck in honor of a good friend and local custom car builder Mark Cain who lost his battle with A.L.S. shortly after we returned from SEMA 2016. 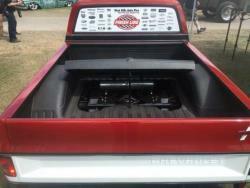 The truck will be auctioned off this spring with proceeds going to A.L.S. research in Mark’s honor." 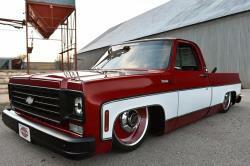 The 1975 Chevrolet C10 truck debuted at the SEMA Show in 2016 in the Covercraft Car Covers booth in the Central Hall of the Las Vegas Convention Center, about as prominent a location as you’ll find. Upon learning of the upcoming auction and examining the truck up close, Street Muscle Magazine wrote, "So what can the new owner expect from this beautiful truck? The list is long, for sure, but it will be a vehicle that you’ll cherish." That long list includes a PorterBuilt Fab front Dropmember with AccuAir ENDO-VT E-Level Ride Management system, VIAIR Compressors and Dominator 2600 air bags front and Dominator F9000 rears. According to Lyon the truck, "Lays frame when aired out, about 12-inches." Rear suspension is also by PB Fab, using their four-link kit, while QA1 shocks all around handle damping duties. 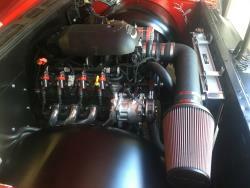 Under the hood is a significantly more modern 2006 5.3L LS V8. Bolted to the back of the LS is a Chevy 4L65E driving a 12-bolt fitted with a Detroit Truetrac LSD wrapped by a 3.73:1 ring and pinion. Intake air is channeled through an AIRAID 101-302 U-Build-It Master Kit directly into the AIRAID 200-512-1 PowerAid Throttle Body Spacer, which is designed to increase part-throttle torque and improve mid-range power. The spacer utilizes a unique, patented Helix Bore to spin the incoming air charge as it passes through the throttle body spacer. This increases the velocity of the intake air and improves atomization of the air/fuel mixture in the combustion chamber. Spent gases are moved from the engine compartment by a Hedman C10 LS Swap Ceramic Coated Header with Stage 8 Locking Header Bolts. Inside the cab, the driver controls the C10 via a CON2R custom steering wheel with a Finish Line Speed Shop logo in the hub, which is mounted to a tilt column and shifter assembly from Ididit. Covercraft Floor Mats created unique floor mats and a dash mat with the Strike Out A.L.S. ribbon. Keeping driver and passenger (even more) cool is a Vintage Air HVAC system. While the seats remain the OEM bench, they’ve been re-covered and feature suede inserts with Rostra seat heaters. Tunes are blown out through a Bluetooth controlled head unit via a KICKER IQI interface. A custom enclosure behind the bench seat houses three eight-inch subwoofers powered by a dedicated amplifier, while upper registers are handled by two sets of 6.75” speakers mounted in the doors and powered by a four-channel amp, all courtesy of Kicker. On the inside DEI Boom Mat sound deadener and insulating were installed throughout the cab to keep the tunes in and road noise out. More interior details include custom pinstriping on the glove box, ash tray, H3 Performance Fire Extinguisher and inner front fender filler panels with House of Kolor striping paint by the talented Ron Wall of Off The Wall Kreations. Vital information is provide to the driver via a Dakota Digital HDX gauge cluster, while a Rostra Precision backup camera is cleverly embedded in the rear view mirror. You hardly need to tilt your head to spot the Centerline Smoothies wheels, perhaps one of the most attention-getting components on the truck. With 22” x 9” all around wrapped with 265/35R22 Toyos in the front, and 285/35R22 Toyos in the rear to say they make a statement is, well, an understatement. There’s always plenty of attention and admiration wherever the truck is parked, perhaps as much for its paint as any other feature. The paint comes from the world-renowned House of Kolor, with S2-LE03 Blood Orange over KD3004 Red Sealer and BC26 White with Ice White Pearl side covers. To complete the package and make it auction ready, there’s a custom billet badge of the Strike Out A.L.S. ribbon mounted to the tailgate. A fitting tribute to a good friend to many, who was never too busy to help out on someone else's project.